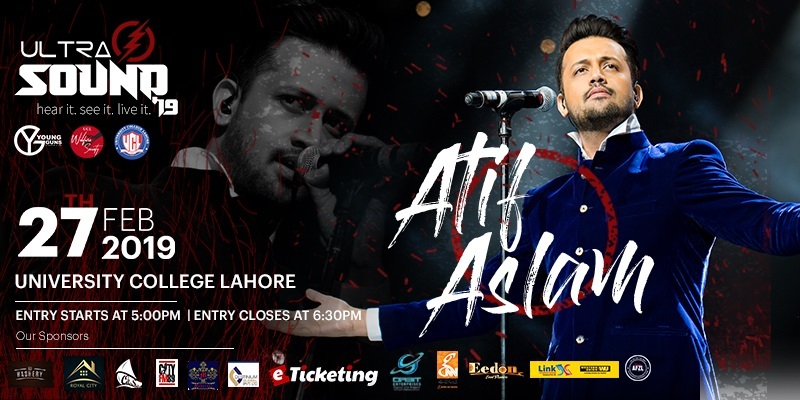 Stay tuned for upcoming events for Atif Aslam in near future. Atif Aslam is a Pakistani singer and film actor. He made his film debut in the 2010 social movie Bol. He has recorded numerous songs that topped the charts and is famous for his vocal belting technique. He was stated the most liked artist on an Indian music streaming service Saavn in 2013. Atif is the youngest person to receive Pakistani civilian award Tamgha-e-Imtiaz. His friends encouraged him for singing during his college days and recorded his first single "Aadat" that became popular within weeks. Soon after, he released his first solo album"Jalpari" including the songs Woh Lamhey, Dil Haarey and few others. These songs were hits on both Pakistani radio stations and music channels. Some other songs from his first album such as Bheegi Yaadein", "Ehsaas", "Mahi Ve", "Ankhon Sey" were also major hits. He released another two solo successful albums Doorie and Meri Kahani following Jal Pari. He then recorded over two dozen hit songs for top Bollywood movies within three years where his work on the film Race was chosen for the Filmfare award. University College Lahore, or UCL, is an institute of higher education in Lahore, Pakistan. It offers programs including GCE A Levels, BSc in Economics, Management, Accounting & Finance, Information Technology and Business Administration as well as Bachelors in Law LLB. Terms & Conditions : All Rights are Reserved by the Organiser. Best Viewed at 1024 x 768 pixels and above. This Page loaded in 0.02677 seconds on Tue, Apr 23, 2019 (20:57).